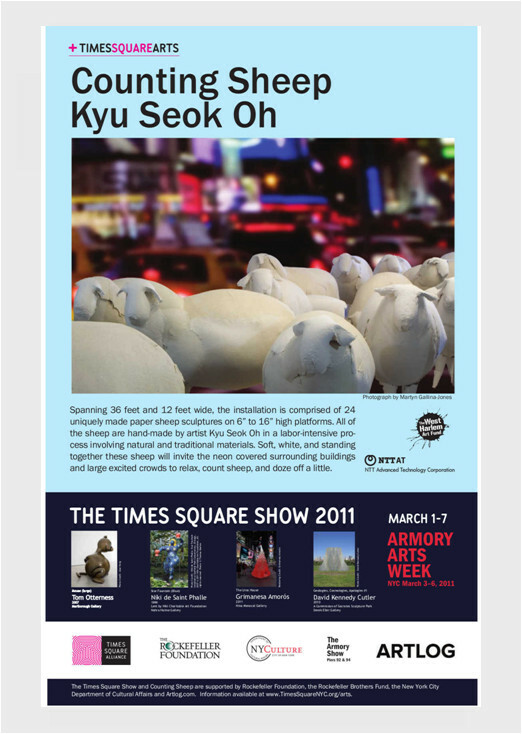 Artist Kyu Seok Oh exhibited his sculpture entitled "Counting Sheep" to the Times Square Show 2011. The sheep were sculpted from cast hand-made white paper and mounted on steel, and coated with HIREC. Once the paper-made soft and white sheep were installed, they took a new life shined with the neon colors of the Times Square. Mr. Oh said in his web site, "A group of white paper sheep suddenly emerging from a corner of Times Square will create a contrast to the intimidating, chaotic atmosphere associated with that sleepless corner of the world. Soft, white, and standing together these sheep will invite the neon covered surrounding buildings and large excited crowds to relax, count sheep, and doze off a little." HIREC guarded his beautiful soft sculptures from rainfall in New York. HIREC, the super water-repellent material was used on the surface of "Counting Sheep" to protect these wonderful paper-made sculptures from rain in New York. The Times Square Show 2011 : Produced with support of Times Quare Arts, The public art program of the Times Square Alliance, and the West Harlem Art Fund.